Alicia Boatswain-Kyte, recipient of SSHRC and FQRSC fellowships, is in her final year of the Ph.D. program at Université de Montréal. Throughout the course of her doctoral studies, Alicia has taught 5 different undergraduate courses at Université de Montreal: SVS1510: Introduction to Social Work, SVS2375: Intervention: Individual, Couple and Family, SVS1284: Introduction to Intervention II, SVS1362: Self-Development and Social Context and SVS1121: Evolution of Social Work Practice in Quebec. For the past five years, Alicia has been the Research Project Coordinator for the Côte des Neiges Black Community Association’s (CDNBCA) Strengthening Black Families Program a National Crime Prevention Centre funded process evaluation aiming to monitor how the community organization changes and adapts against expectations. There is also an outcome-evaluation with pre-post questionnaires assessing constructs of parenting ability, family functioning and child attitudes. In 2012, Alicia was awarded a data analysis research fellowship under the Building Research Capacity with First Nations and Mainstream Youth Protection Services in Québec (BRC) project where she concerted with a child protection agency in Outaouais to better understand service trajectories using longitudinal clinical administrative data. Alicia was also awarded a funded internship through the McGill Institute of Health and Social Policy (IHSP) that aimed to support innovative research on facilitating access to health and social services for minority communities. More recently in 2015, Alicia was appointed research coordinator of a collaborative partnership between a child protection agency and community organization aiming to reduce the disproportionality of black children reported to the child protection system. Alicia completed her Bachelors and Masters of Social Work degrees at McGill University where she made Dean’s Honor List and was recipient of both the Henry Oelberg and Miriam and E. Michael Berger fellowships. Alicia has over 10 years experience as a social worker and student supervisor in a variety of settings including: child protection, mental health, sexual abuse, crisis intervention and elderly abuse. 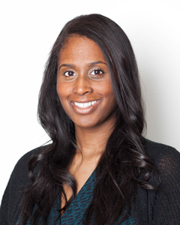 For her doctoral research, Alicia seeks to document the level of disproportionality of black children reported to the child protection system in Montreal and to better understand the challenges to collaborative community-based child welfare partnerships.